I've had the chance to go to Eastwood City last night where I attended an event. 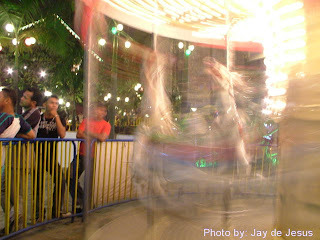 During intermission, I was able to take some shots of the carousel situated at the Eastwood Central Plaza. 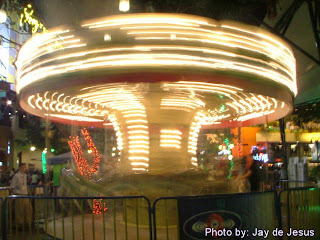 While playing with various settings of my digicam's shutter speed, I was able to take these pics. The first picture vaguely shows the horses in the carousel. The effect seems like they're on a rampage. 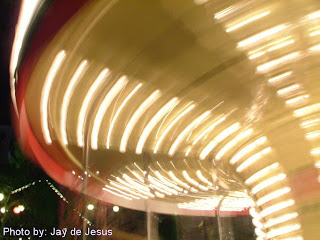 I find them fascinating that the lights on the carousel create a spinning top effect. Taking a closer shot makes it appear to look like an UFO. Subjects like this makes photography fun and exciting to experiment with.